Oh boy – I had been wondering if I’d actually like this book. 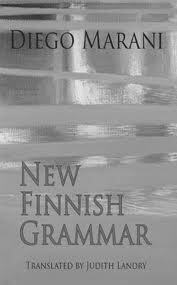 Being 1/2 Finnish heritage I was really impelled to read it. I knew it wasn’t originally written in Finnish or by a Finlander but still – it had great reviews and I just got so curious. So now I’m about 1/3 through and so far it’s fabulous. The book opens with a Prologue written by a Doctor Friari who found the pages of what appears to be a journal, a sailor’s jacket and a handkerchief marked with SK, along with a volume of the Kalevela and a bottle of koskenkorva in a trunk in a military hospital in Finland. The doctor is presenting the pages of the journal to us. He also adds quite a lot of his own commentary throughout the book, explaining what the pages are, their legibility, the letters, etc. The last name, Karjalainen, is a very common Finnish surname. I am really enjoying this book but I’m afraid the theme may be somewhat over my head – it’s about identity and memory and the connection of language (lots of literary type themes available there). This is also a quest story – one man’s search for himself. I am reminded of two books – The English Patient by Micael Ondaatje and The Finkler Question by Howard Jacobson – the search for identity part in both, memory in the Ondaatje book. I don’t quite remember if either book dealt with language. Oh balderdash – you need memory to learn a language and that’s not the only thing – dogs have memory, they remember smells and tastes and sounds – they don’t have language. Man at one point was probably similar (maybe as a chimp?) and developed language because he had something more than memory – the physical attributes which make different sounds possible, for one thing. Moving along – I am fascinated by the relationship of the Kalevala to Finland’s experience with Russia.